This striking poster was created by Valentina Kulagina, who was one of the most expressive woman poster artists of the first half of the 20th century. She was married to Gustav Klutsis (see his posters) - another representative of Vkhutemas-artist generation. This very poster has a strong influence of suprematism, an art movement originated by Kazimir Malevich. The giant red figures of soviet soldiers in budenovkas (military cap) are marching with their shouldered rifles. 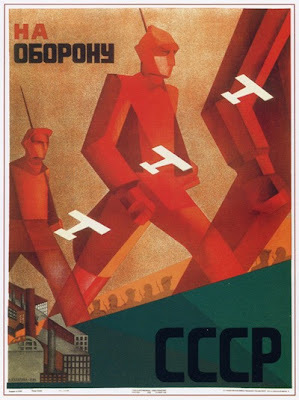 The slogan is simple and motivating: “To Defend USSR”. The poster space is multidimensional, with three color areas contrasting. The distorted cubist perspective of the factories in the left bottom corner adds another dimension. The idea behind is that both factories and the Red Army add to the defense potential of the country. The workers are transforming into determined soldiers as they are marching away from their workplaces. And the white airplane silhouettes fly through as if there are no barriers for them whatsoever. What a mind-blowing work of art it is.